I was out at a generic Irish pub and found the Glacier Harvest on tap. 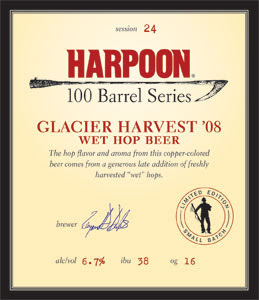 It's a member of Harpoon's 100 Barrel Series so it is only available for a limited time. The Glacier Harvest had a very alcoholly taste and it seems this beer was driven by its bitterness. The bitterness is most likely the result of the wet hops. Wet Hops, are essentially fresher hops that have been harvested in the last 24 hours or so. They are supposed to give a fuller hop flavor. It also appears this beer had an 07 distribution as well, as I found an email from a friend discussing this bee and the wet hop process. I, however, was not interested in an encore performance. The 6.7% ABV and the bitterness defeated me and I give this beer a 2.0.